Mason Jar Salads - My Newest Obsession | La Petite Noob | A Toronto-Based Fashion and Lifestyle Blog. La Petite Noob has not been feeling so petite lately. The cold weather, mountains of snow and ice have forced me into hibernation and, subsequently, into comfort eating. In an effort to not to waddle into Spring as a bloated Michelin man, I've been taking my meal preparations more seriously - specifically when it comes to work lunches. Mason Jar Salads are my favourite way to prepare a series of work lunches - they're quick, easy and are visually beautiful. Read on for my method of preparation, as well as little tips I've picked up along the way. The beautiful thing about Mason Jar Salads is their simplicity. The method of layering salad ingredients from heaviest to lightest ensures that any dressing placed at the bottom of the jar stays in place, preventing your greens from getting soggy and keeping the salad crisp and fresh. Got it? Good, because that's it! Once you master the layering process of heavier items to lightest then you can start the fun of discovering different salad combinations. What Size Mason Jar Should I Use? I have found that quart-sized jars work best for Mason Jar Salads, allowing room for a multitude of delicious salad ingredients, as well as room for greens. If you are someone who prefers a simpler salad with only one or two different toppings to go along with your lettuce then a pint-sized Mason Jar will do just fine. How Long do the Mason Jar Salads Last? 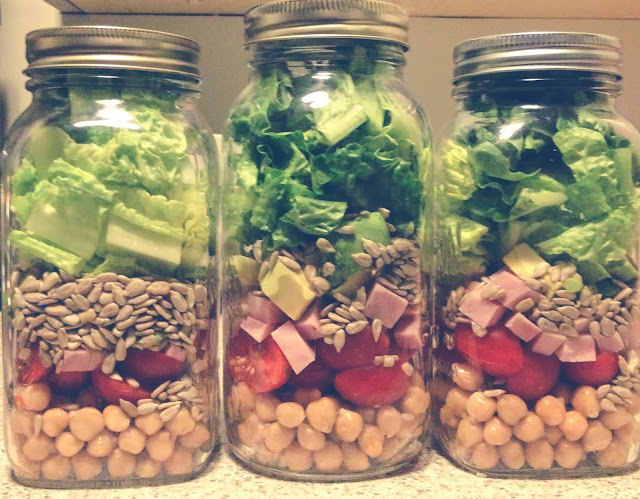 I prepare my Mason Jar Salads five at a time, allowing for a full work week of delicious lunches. Of course! Here are some helpful little tidbits that I have picked up along the way. If you plan on using avocados in your Mason Jar Salad, don't forget a generous spritz of fresh lemon juice. This helps to prevent any browning. Don't forget your fresh herbs. Seasoning your greens with fresh herbs packs a ton of flavour, and reduces the amount of dressing that you will need. My favourites are springs of basil and chopped cilantro. Change it up. You will be making up to five salads at a time. Duplicate your same recipe another week and that's potentially ten of the same lunches in a row - a recipe for disaster when boredom strikes and you find yourself chipping in for an office pizza. Get creative and have some fun! Challenge yourself to a completely different mix of Mason Jar salads each week, and always look forward to lunch. These look super tasty! 1 question, do you shake them up then serve or just pour them into a bowl and stir? Usually the jars are packed so tight that there isn't much room to shake - I just dump the contents of the jars into a bowl and stir! Get out - that's awesome! I will for sure tell her that you say hi. Thanks for stopping by and reading!